The Fresh Music Page: Is Jennifer Hudson Singing Cute? Weight Loss, Vocal Decline? Is Jennifer Hudson Singing Cute? Weight Loss, Vocal Decline? Oscar and Grammy award winner Jennifer Hudson looks great with her new body. She seems happier but is Jennifer Hudson now singing cute? What do I mean by Jennifer Hudson singing “cute”, I know you’re asking yourself. I mean has the powerhouse singer Jennifer Hudson gotten too cute to let it really rip? Jennifer still sings better than 95% of today’s current singers but I’ve notice that she’s not tearing up songs like she use to when she was heavier. Here goes that old Luther Vandross debate again (Big Lutha’ or Lil’ Lutha’?). Does heavier Jennifer Hudson sing better than lil’ skinny Jennifer? I thought I was the only one that notice the difference but I’ve heard it from others as well. What happen to the Jennifer Hudson from American Idol with the bad curly weave, terrible dresses, and slightly on the over-thick size? That Jennifer Hudson had a dynamite voice! I voted 63 times (YES sixty-three times) for that Jennifer Hudson on American Idol. Her belts just aren’t the same. She’s missing some of the power that she use to sing with. I wonder is this part of her make-over, slimmer body and smaller voice? In their primes Whitney Houston, Mariah Carey, Barbara Streisand, and Chaka Khan all had small bodies and huge voices. With the exception of Streisand they had big hair to match their big voices. Maybe Jennifer Hudson should try big voice and big hair? Many believe that 20th century Opera Diva Maria Callas vocal decline had to do with her dramatic weight loss. Before her 80 pound loss she was known for her beautiful full tone and dynamic range. Afterwards her voice was breathy and hardly beautiful. The power seemed forced. I have a theory about what caused her vocal decline, but it's more from watching her sing than from listening. I really think it was her weight loss that was so dramatic and so quick. It's not the weight loss per se... But if one uses the weight for support, and then it's suddenly gone and one doesn't develop another musculature for support, it can be very hard on the voice. And you can't estimate the toll that emotional turmoil will take as well. I was told, by somebody who knew her well, that the way Callas held her arms to her solar plexus [allowed her] to push and create some kind of support. If she were a soubrette, it would never have been an issue. But she was singing the most difficult repertoire, the stuff that requires the most stamina, the most strength. Maybe Jennifer Hudson needs to develop another support for that wonderful voice. Interesting to say the least. What do you think? 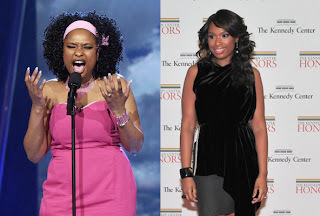 Is Jennifer Hudson simply just holding back or could it be her weight loss playing a role? She’s just singing too “cute” for me. dumbest post I have EVER read, weight has nothing to do with vocal ability..
@Kizzy Yes, I do believe it took months but 60 pounds lost is a lot for the body to adjust too. When I say dramatic I don't mean she took off the weight literally overnight but 60 pounds is a lot. @Anonymous Weight is part of the body and so is the voice. When your body change, your voice does have a habit to change also. Women lose range during their menstrual cycle. If you could spell or properly use grammar, I might consider being offended. Wow, these comments are brutal. But anywho, I haven't heard any of Jen's material so maybe I am on the late bus? If she is singing "cuter", it could be more from a production standpoint and the record company trying to make her more mainstream and "pop" versus the weight loss. In her case, I don't think it has anything to do with it OTHER than now they feel she can sell more records because she is "skinny". You know I can always bring out the wacky ones.lol I was actually referring to her live appearances lately. Like I said she still sings better than 95% of the artists out. I just noticed she hasn't been ripping them like "Big Jen" did.